THE Dirt Bike Game For The PS3, MX VS ATV REFLEX! If you're looking for a dirt bike game for the PS3, this is it! The game was just released Dec 1, 2009. We made sure to get our hands on a copy as soon as we could. Having looked at the game briefly, it's obvious that this has followed in the footsteps of the previous additions of the MX vs. ATV series, which is a very good thing. MX VS ATV Reflex is much better though as it takes a giant step towards realism. The biggest improvement has to be in the terrain itself. This game features deformable terrain. You can tear grooves into the terrain and it will remain a permanent feature for as long as you ride on that level, even in freeride mode that can span many miles. Do a doughnut in place for a while and you'll dig a crater for yourself to drive out of! A side benefit to this feature is that if you are in freeride mode, you'll be able to see your tracks when you return to them. This really enhances the realism of the game, and personally is one of the things I have been waiting for in a game such as this. The new system powering this feature is also said to allow 10 times the resolution when compared to the polygon-based system in previous games. The dirt looks better than before, but the feel of the ground is just as impressive. The difference between varied terrains such as mud, snow, sand etc. is much more pronounced. If you're looking for a dirt bike game for the PS3, this is the best I've seen by far. It really focuses on the smaller machines such as bikes and quads, which is good because this is where other games of this type have fallen short, especially with the bikes. Stay tuned for more on this game as we have a chance to play it more, until then check out these amazing screen shots! Click on the thumbnails for a full screen view! I must try to play this game. I like your photo about this game. Make me more intresting to buy it and playing this game. the graphics looks real. i hope the gameplay too. can you like customize the dirtbike parts? ok, obviously this site has not corrected the name of this game! it's called MX vs ATV: Reflex! it's a $60 game for the ps3. Yes, I am sorry, I am aware of the name and it does state the name in the post and in previous posts..I will fix it here:) Didn't mean to cause any confusion. Yes, you can customize the bikes. You can get stuff like FMF exhaust, Maxxis Tires, Renthal bars, grips, graphics etc. It has KTM bikes and also Red ones, blue, yellow..apparantly they don't have the rights to use the name Honda, Yamaha, Suzuki.?? We paid around $50 for the game..It's well worth it. 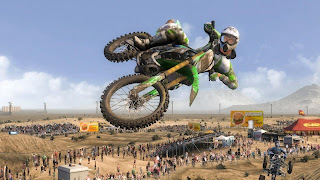 Dirt bike racing game is really a very nice one for us. Pretty cool event was able to watch it and it was awesome! I am big fan of this game. I always try to watch this game live on the field, But i don't ever miss it on the TV also. I always think I should be on of them. So when i read about this video game My heart says lets be one of them not it real game but at-list in this video game & I get this game I rely love playing it. Just like I am in the real game. my fiance' loves this game with a passion!! i got it for him for xmas and he doesnt stop playing it!! someone needs to create a new mx game!! this one is getting old really fast!! I am eager to play next edition of this game I am sure their must be next version you can't stop here. Really very cool game. specially the graphic is awesome dude. It feels like we are in the real game.